Sen. Claire McCaskill (D., Mo.) lambasted Hillary Clinton as a "phony" during an April 2000 interview with the State Historical Society of Missouri that touched on McCaskill's critical view of how the former first lady handled Bill Clinton's infidelity. McCaskill, then in her second year as Missouri's state auditor, was interviewed at length as part of the historical society's Politics in Missouri Oral History Project. 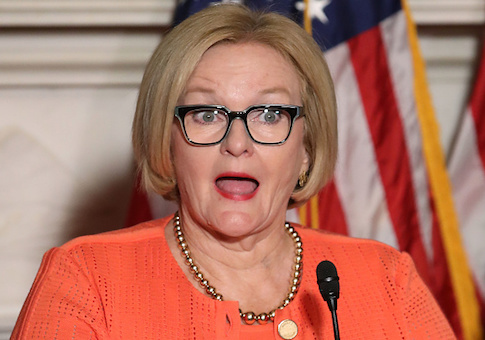 McCaskill brought up the topic of Clinton's handling of former President Bill Clinton's affair on her own accord after she was asked how she dealt with her own husband's arrest on a casino boat for marijuana possession. McCaskill said she was told to give a statement supporting her husband but instead decided to say exactly how she felt and thought Clinton should have handled her husband's affair with intern Monica Lewinsky the same way. "That's when Bill Clinton was going through all this, I kept saying, ‘Why doesn't [Hillary Clinton] really say what she thinks,'" McCaskill said, according to the interview transcript. "That's what was so phony about it." McCaskill laid out exactly how she would have responded if she were in Clinton's shoes. "I guess people could say she was classy, but I wouldn't have even done that," McCaskill said. "I would have said, ‘You know, I'm moving out of the bedroom and we may patch this up, but he's a jerk and I'm furious at him and I think the country should be furious at him!’ That's what I would have said if I was Hillary Clinton!" McCaskill said she thinks people are "very forgiving" to politicians who are "really open and honest." "Being up front saying exactly what you think is usually not going to get you into trouble," she said. McCaskill's interview with the historical society is biographical and closely mirrors the narrative told in her 2015 memoir, Plenty Ladylike, which also covers her upbringing and career as a young prosecutor with political ambitions. One of the few areas of inconsistency comes during the memoir's mentions of Hillary Clinton, who at the time of the book's publication was running for president. McCaskill writes in the book that it was a "huge mistake" to speak authentically about the Clintons during her initial Senate run in 2006 when she said on Meet the Press she wouldn't want her "daughters near" Bill Clinton. McCaskill realized it was a mistake once she learned the realities of criticizing the Clintons, who canceled a fundraiser they had scheduled for her campaign, leading her to write apology letters to each of them. "It was stupid for me to say what I did," she wrote. "It was gratuitous and hurtful, and there was no excuse for it." "I wrote notes of apology to both President and Hillary Clinton, and I apologized to both of them in person the first chance I got," she wrote. "I am grateful that the Clintons have been kind and gracious to me since then." McCaskill always had high political aspirations, but at the time of her historical society interview her goals were all within Missouri, where crossing the Clintons was less impactful. "I really want to be governor," McCaskill said when asked what she hoped to do after her term as state auditor expired. She said she viewed her job as auditor as "a great place to prepare for the job of governor." McCaskill would run for governor in 2004, impressively defeating the incumbent governor in the Democratic primary but losing to Republican Matt Blunt in the general election. The defeat pushed her to launch her campaign for federal office the next year and eventually unseat Republican senator Jim Talent. McCaskill would again end up on the Clintons' bad side early in her first term when she got behind Barack Obama in the 2008 presidential primary, but she worked to repair the relationship in 2013 by becoming the first to endorse Hillary Clinton for her failed 2016 run for president. Earlier this year, however, McCaskill was back to criticizing Clinton, this time for labeling states like Missouri, which voted overwhelmingly for President Donald Trump in 2016, as backwards. "For those of us that are in states that Trump won we would really appreciate if she would be more careful and show respect to every American voter and not just the ones who voted for her," McCaskill said. McCaskill's campaign did not respond to a request for comment on her old advice for how Clinton could have handled her husband's infidelity more effectively. A spokesman for Hillary Clinton also did not respond to a request for comment.